You really, really don’t want to be on this Santa Claus’ naughty list. Decking the halls with boughs. Putting up trees. Frantically searching online for gifts for the one annoying relative who always says they’re “fine with whatever!” We all have traditions this festive time of year. For Grant Morrison and Dan Mora, it’s releasing another chapter of their bonkers take on Santa: Klaus. And io9 has your exclusive look inside. 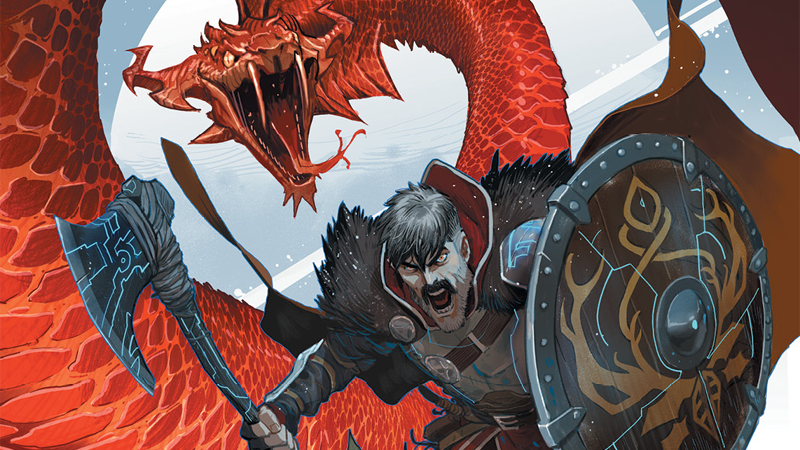 Since Klaus began in 2015—re-imagining jolly ol’ Saint Nick as a significantly less jolly, significantly less ol’, and significantly less saintly barbarian warrior—Morrison and Mora have returned to the wild world they’ve created in yearly holiday specials, and 2018 is no exception with the arrival of Klaus and the Crying Snowman from Boom. Variant cover art for Klaus and the Crying Snowman. This time, Klaus is going a bit God of War—Crying Snowman sees the strapping immortal warrior doing battle with a whole pantheon of Nordic gods to rescue the titular snowman, who is actually a doting father who finds himself cursed into a frosty form. But as you’ll see in io9's exclusive preview of the one-shot below, he’s going to have to carve his path through some monstrous foes in his quest to lift the curse. Klaus and the Crying Snowman interior art by Dan Mora. Klaus and the Crying Snowman is set to put some suitably Grant Morrison-y holly in your proverbial jolly on December 12. Anyone Have $10 Million I Can Borrow to Buy These Rankin/Bass Rudolph the Red-Nosed Reindeer Puppets? Open Channel: Which Fictional Character Would Make the Best Santa Claus?